Year after year, survey results continue to show the same thing – lack of employee engagement costs the U.S. economy roughly $370 billion a year. Along with the financial impact, low engagement levels also impact company culture and efficiency. 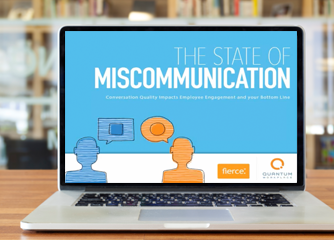 Join Beth Wagner, Fierce Master Facilitator, and Megan Maslanka, Director of Client Success at Quantum Workplace, as they build on the survey results of over 1,300 employees and share how to ensure your organization is having conversations that get results.